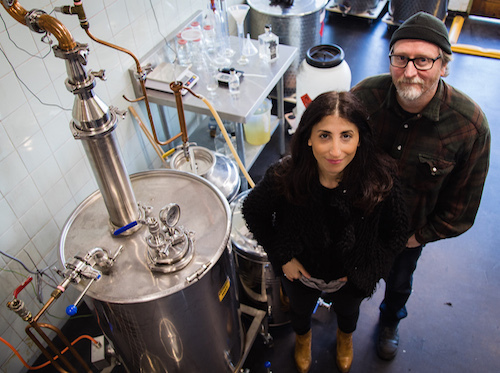 Cedar Fox Distilling Co. is a small batch distillery founded by brewer/distiller/musician Craig Westwood and journalist/lawyer Ran Zaydan. Located in the Northern Suburbs of Melbourne, Cedar Fox makes Gin, Oak Gin and other fine spirits. Stomping around together for more than two decades, Craig and Ran have immersed themselves in the Australian independent art and music scene as well as the burgeoning international and local craft brewing and distilling industries. They bring an unconventional and DYI approach to just about everything they do, Cedar Fox being no exception to this. The journey of Cedar Fox Distilling Co began in 2010 with Craig taking up a role as a brewer with White Rabbit Brewery, after many years home brewing. Shifting direction in 2012, Craig then went on to New World Whisky Distillery (STARWARD) as a brewer, distiller and blender, fortifying his passion and interest for spirits and distillation. In late 2013 Craig joined the brewing team at iconic Australian craft brewery Mountain Goat Beer and became the barrel manager for their award winning barrel breed program. His time spent at goat proved fruitful with the brewing team receiving numerous industry awards and accolades. Ran and Craig began work on developing recipes for Cedar Fox back in 2015, striving to create products that reflected their ideas on achieving complexity and quality through simple and minimal means. Exploring new flavours and processes fuels their desire to engineer and refine their signature range of spirits. At heart Craig is a tinkerer and loves nothing more than creating and experimenting within his distilling space. In 2017, Craig and Ran finally launched Cedar Fox Distilling Co, working out of their kitsch distillery in Coburg. Their gins utilise urban Melbourne ingredients with roots to their heritage and home life – a homage to diversity in Australia. The artwork on the Cedar Fox bottles is a nod to both their backgrounds and history and was created by Australian born, New York based artist Seldon Hunt. The artwork references Ran's heritage, coming from war torn Lebanon, while for Craig it is an arc back to his musical and artistic activities over the past 25 years. The fox is symbolic of an introduced species into Australia - Just as they both were at different times and for different reasons.